Palm's got great hardware, and WebOS is a genuinely terrific operating system. But that's not enough anymore. While Android's got a plethora of hardware partners, Palm's trying to go it alone in a vertically integrated world. 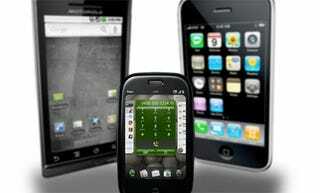 It's a numbers game, really: Palm owners have 2,000 apps available to them. The Android Marketplace has fifteen times that, and the iPhone's got 150,000. If developers have given up on WebOS—which it certainly seems like them have—consumers have no reason to stick around. Especially given that the more money Palm loses, the harder it becomes for them to innovate on the hardware or the software side. So Palm's got great guns, they just don't have any ammo. This isn't a new revelation; John called it back in October, when it was first clear that Palm was being squeezed out by the combination of Android and iPhone. What's different today is that the financials have finally caught up to the facts. "If we could have launched at Verizon prior to the Droid, I think we would have gotten the attention the Droid got. And since I believe we have a better product, I think we could have even done better." Easy to say, impossible to prove. And even if Droid stole some of Palm's thunder, that's nowhere near the totality of the company's problems. If yesterday's earnings call put Palm on life support, its grave is being dug by Wall Street, with analyst Peter Misek handing out the shovels. Misek's prediction today that Palm's stock price would hit zero within twelve months is the kind of headline-grabbing, self-fulfilling prophecy that makes me not like analysts very much. It's also effective: Palm shares are already down 25% today. And while that could make it a more attractive buyout target for Google or whomever else, that kind of transaction takes the kind of resources and time that Palm may not have. So where does that leave Palm? Bleeding out, with more than a million phones sitting in their inventory waiting not to get sold.